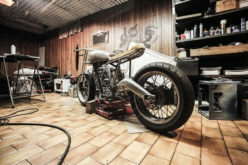 Whether you are looking out for ideas to create a garage space in your home or are just bored of the old arrangements in the garage or even looking to make some more space in your garage, you know it is not that an easy job. It takes a lot of work and brains to create an attractive, spacious and clean garage space with as less space as possible, making the optimum use of whatever space available. 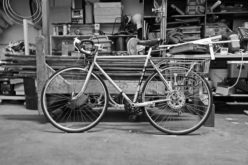 Piles of tools with other stuff like the skateboards, tennis rackets, basketballs, dog food, and the old refrigerator – never to forget your bicycle and its equipment, the gaps in between filled in by the rat droppings, which may also pose a health risk – phew! The garage indeed drives you away from it. 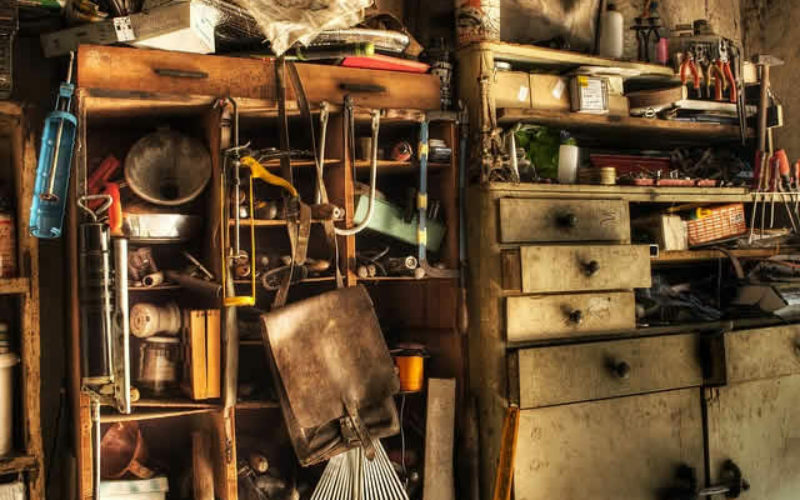 But worry no more, after reading these 7 Ways to Hang Your Tools in the Garage, you will get some idea to start on organizing your precious little space. 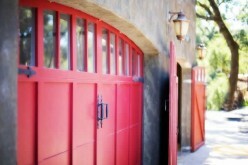 You may want to install peg-boards on the walls of your garage before going ahead with these ideas. The main idea here is that we are giving each and every item its own slot near or on the walls, thus leaving nothing on the floor. Pegboards are an excellent way to hang the garage tools and other stuff around and making the maximum use of the wall space. 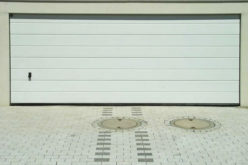 In addition to this, they give a clean look to your garage with nothing scattered on the floor. 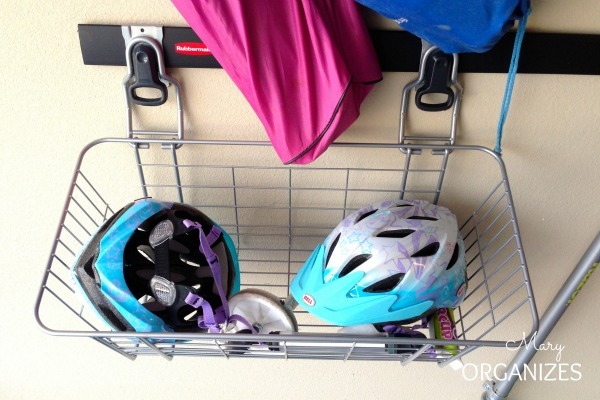 Hooks, along with the pegboards make the best organization of the tools in your garage. 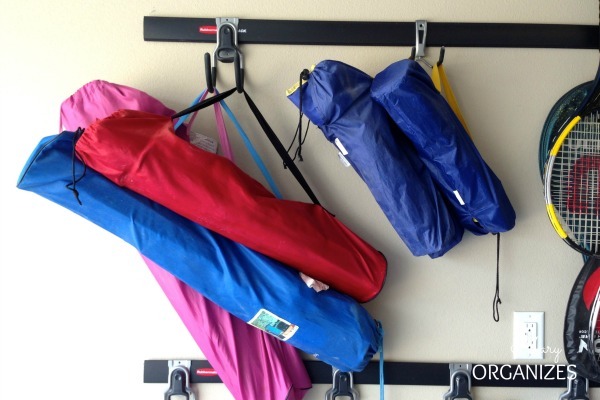 You can use the hooks to hang many things like your backpack tool bags (when you are not using them), the sports equipment like the badminton rackets, bags, and almost any random thing. In addition to the pegboards and mounted hooks, you may also use magnetic wall strips and even sections of PVC pipes to add to the organizing. Here are a few ideas. 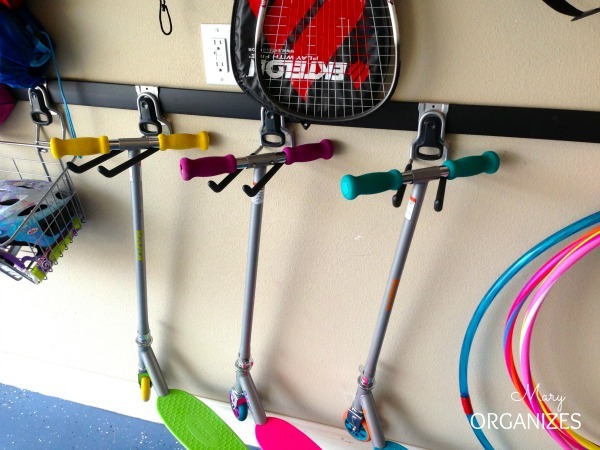 Using hooks to create a mini parking space for the kids’ scooters is actually a great idea. So, no more stumbling upon those bikes every now and then. Also, your kiddos can boost around about the separate parking space for their vehicles. Now that the parking lot is ready, how about a separate space to keep the helmets? Yes, you can always mount a steel basket to the pegged boards using the hooks and store the helmets in it, just like the image. You can even store motorcycle accessories to the basket. This idea has two advantages – first, there are higher chances that the kiddo drivers go riding with their helmets on and second, no more helmets on the floor. What else can be more exciting? In spite of their flexibility and foldability, camping and/or sports chairs seem to occupy more space than they should if they are not arranged properly. Use the mounted hooks in order to create a separate space for them, so that they are easily accessible when they are needed the most. The ball holder should have apt designs that ensure that you can remove the bottom-most ball without many hassles and removing the upper balls. 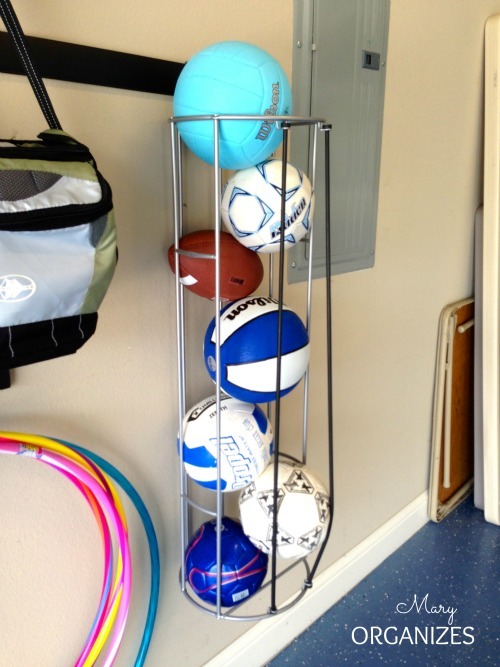 Again, the mounted hooks and the ball holder make a brilliant hanging ball holder just like the one in the image. Just make sure that you have the right volume of the holders, just in case. If you just hang a hose without any support, it might lose its shape and lose its utility. In addition to this, the excessive heat and cold cause changes in the amount of water or whatever they transport. Over time, if not shielded from excessive heat or cold, it may cause wear and tear of the pipes after some years. So, fix a large bucket with plywood in the bottom into the wall of the garage. This plywood ensures that nothing other than the buckets gets holes in it so that the shape and the capacity of the pipes remain there. You just coil the pipes over the bucket. This solves the problem. You can make use of typical brackets to store long tools and stack them one on the top of another. This actually is an efficient use of wall space without the need for much investment. The design shown in the picture allows you to reach the tool which you exactly need. Now you can conveniently hang the rakes and shovels individually without using up a lot of space. 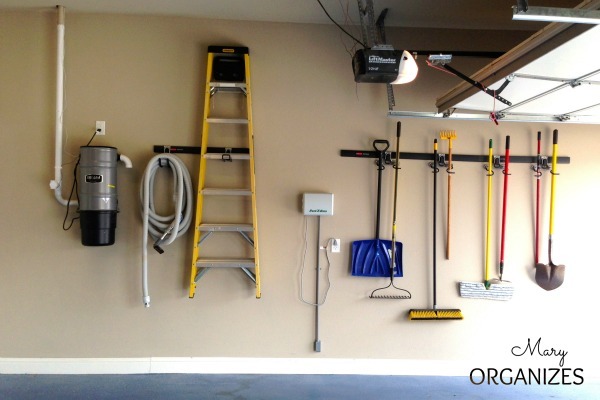 If you have a vacuum cleaner, ladders, brooms, mops, etc, you can use the remaining wall space in your garage and hang them using mounted hooks, just like in the image. 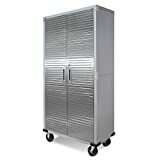 Again, this will help to keep such equipment off the floor and helps to use the floor for other purposes. 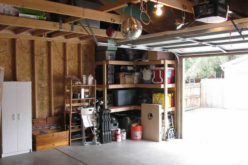 Before concluding, here are a few general tips on organizing your garage space which may help you while redesigning your garage. 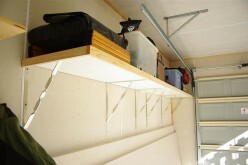 You can save the floor space in the garage by creating a ceiling storage space using a sliding storage system. All it requires is a few plastic bins and a tracking system. 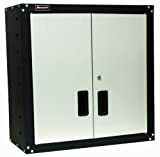 Install cabinets as they are one of the affordable and effective garage storage solutions ever available. 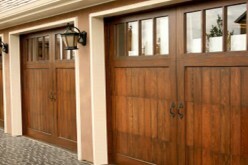 What more, it also gives a clean and a classy look for your garage, with an assigned place for all kind of items. Make the most of even the smallest space available. If there is a narrow place behind the garage door, make optimum use of it by putting up a shelf and keeping your things on it. You may also want to have a rolling cart to keep things that you frequently want – like a torch, a magnifying glass, hammers, etc. You could keep them in sight when needed and push them away when you don’t require them. Make separate closets or storage spaces for items depending on their purpose. For example, all the tools and fertilizers pertaining to the garden can be stored in a garden closet, so that all the garden-tools are accessible from one place. These were a few tips to hang your tools in your garage so that you can get more of the floor space at your disposal. 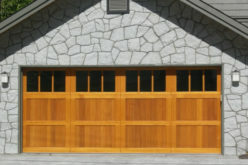 Just remember that there is no one-fit-for-all solution or method to organize your garage. It all depends on your creativity and requirements. All the Best!! Harold Camaya is a blogger who loves to write in different verticals. She co-authored Supercharge Organic Traffic: A popular course focusing on Organic Traffic for Ecommerce. Her hobbies are traveling and reading.